GLH has debuted its new four-star Every Hotels brand in London. 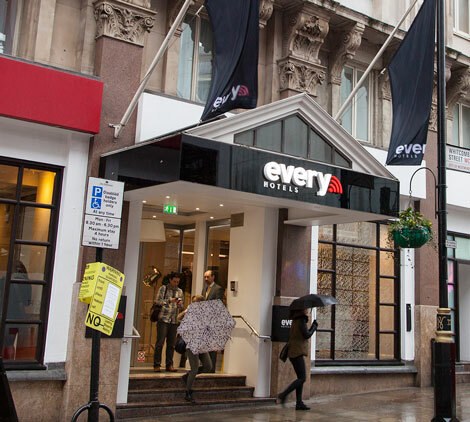 The Every Hotel Piccadilly, formerly Thistle Piccadilly, is the first Every property to open worldwide and the first of four in the capital. The next three hotels — Every Hyde Park (formerly Thistle Kensington Gardens), Every Leicester Square (formerly Thistle’s Royal Trafalgar) and Every Bloomsbury (formerly Thistle’s Bloomsbury Park) — are scheduled to open in the next 18 months. GLH said it plans to open “up to another 50 hotels by the end of the decade”. The idea behind the new brand is to remove the “wasted space” taken up by restaurants, ballrooms, meeting spaces, spa and swimming pools. Instead, Every properties will offer “bedrooms with the same up-market comfort and quality, but without needing the excessive investment and overheads that accompany extensive non-rooms facilities”. GLH claims that Every Hotels offers the “fastest ever” free, unlimited wifi to guests, with Every Hotel Piccadilly currently offering a speed of 246 mbps. Every Hotels CEO Richard Sofer said: “What came out loud and clear was that guests wanted a great room with great tech, in a great location. GLH has also recently launched another four-star brand called Amba (see news, October 2013). Again, the first four properties are in London.